KS Engineers, P.C. (KSE) was retained by PRG Parking Management, LLC (dba as The Parking Spot) to provide design and construction management services for the redesign and rehabilitation of six parking lots at four airports in New York, New Jersey, and Pennsylvania. For all six parking lots, KSE was responsible for conducting general surveys, taking core samples to determine the composition of pavement and sub-base, pre-bid meetings with potential contractors, responding to requests for information (RFIs), collecting and analyzing bids, providing recommendations to the owner regarding a preferred bid, and preparing contracts for contractors once a bid has been accepted. KSE also provided Construction Administration services, including review of shop drawings, RFIs and change orders, approval of monthly pay disbursements, and site visits to certify that construction was taking place in accordance with the project plans and specifications. The Parking Spot McClellan is located on McClellan Street in Newark, NJ. It is an openair valet parking facility with a service building. For The Parking Spot McClellan, KSE’s responsibilities encompassed both exterior work on the parking lot and interior work on the structure. 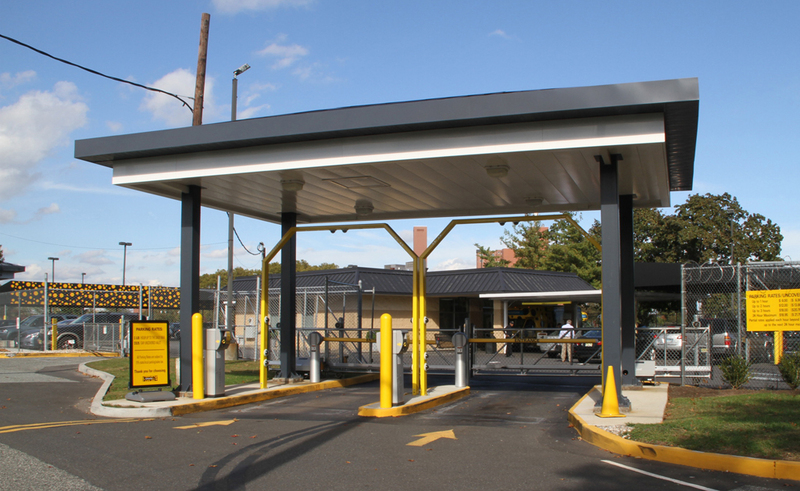 The exterior work included the design of a new entry/exit plaza, which involved the addition of metal canopies and concrete islands, and the installation of ticket machines, gate arms, video arches, slide gates, and signing and striping. A new bus entry/exit was also added. The paved area around the existing building was milled and repaved. A new electrical service point was established, the existing electrical service equipment was relocated from the street to the building, and the existing parking lot lighting was rewired for code compliance. The exterior of the building was repainted, the awnings were replaced, and a new roof was installed. The interior of the existing building was gutted and rebuilt, including lighting, ceilings, doors, and ceramic and carpeted floors. Electrical service throughout the building was upgraded. New sinks and countertops were installed in the rest rooms. New and improved millwork was installed, as well, including the customer counter, the breakfast/coffee station, and the video display. Finally, the break room was upgraded, including new cabinets and flooring. The completed plans were submitted for approval, in order to obtain building permits.